The tree is small to medium in size, reaching 1–8 m (3 ft 3 in–26 ft 3 in) in height. The branchlets are not glabrous or finely pubescent, 10–20 cm (3.9–7.9 in) long, usually deciduous; the leaves are simple, subsessile and closely set along branchlets, light green, resembling pinnate leaves. The flowers are greenish-yellow. The fruit is nearly spherical, light greenish yellow, quite smooth and hard on appearance, with six vertical stripes or furrows. In traditional Indian medicine, dried and fresh fruits of the plant are used. 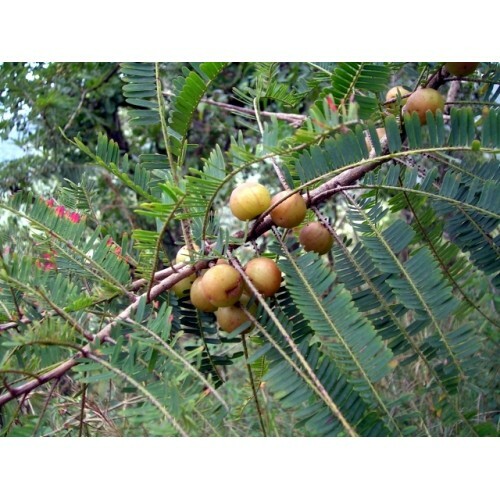 All parts of the plant are used in various Ayurvedic/Unani medicine (Jawarish amla) herbal preparations, including the fruit, seed, leaves, root, bark and flowers. 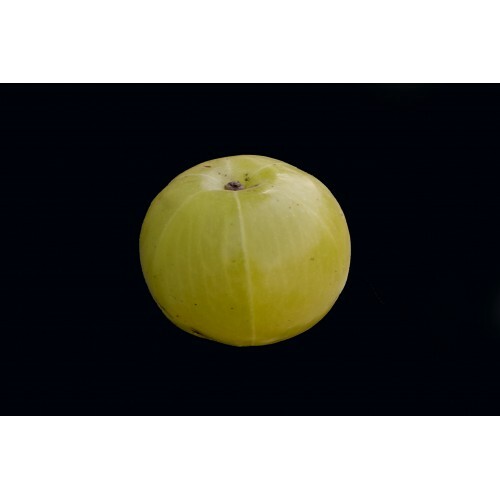 According to Ayurveda, amla fruit is sour and astringent in taste, with sweet, bitter and pungent secondary tastes. Its qualities are light and dry, the post digestive effect is sweet and its energy is cooling. According to Ayurveda, amla balances all three constitutions of body. While amla is unusual in that it contains five out of the six tastes recognized by Ayurveda, it is most important to recognize the effects of the potency, and post-digestive effect. Considered in this light, amla is particularly helpful in controlling bilious constitution because of its cooling energy. It also balances both bile and airy element by virtue of its sweet taste. The water element is balanced primarily due to its drying action. It may be used as a rejuvenative to promote longevity, and traditionally to enhance digestion, treat constipation, reduce fever, purify the blood, reduce cough, alleviate asthma, strengthen the heart, benefit the eyes, stimulate hair growth, enliven the body, and enhance intellect. AppearanceThe tree is small to medium in size, reaching 1–8 m (3 ft 3 in–26 ft 3 in) in height. The ..